A biker’s greatest fear is a driver opening a car or truck door just as the cyclist is passing. These accidents, called doorings, can have devastating consequences: injuries to the skull and brain, spinal injuries, broken bones, and lacerations. Sometimes the rider is forced into the next lane’s traffic, where worse violence occurs.Most bike accidents involve drivers who are not looking for bicyclists. Bikers can be biking to work or school or just for an outing. Accidents happen during lane changes, in intersections and at crosswalks. Some of the most serious accidents involve young children on bicycles. There are several reasons for injured bicyclists to seek rightful compensation. For one, it is simple justice to be compensated for injuries caused by wrongful acts or negligence. Another is that bicycling is an important part of the transportation story in Orange County. Bikers cause less pollution and less congestion than any other mode of getting around. They deserve every consideration in traffic, as is their right under California law. But they do not always get the respect they deserve, on the street or in our courts. Chambers & Noronha is among the oldest and most admired personal injury groups in Southern California, active in teaching other lawyers the highest standards of ethical practice. Our attorneys are up on California case law, so they are aware of precedents that have a bearing on your case. 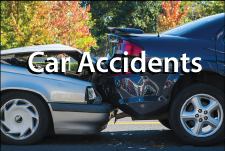 Were you injured in a collision with a motor vehicle? Call the Orange County personal injury attorneys who will stand by you. Call 714-558-1400 with questions — or ask them by email.